Summary: The Ultrasport Adjustable Abdominal trainer is more powerful than your first impression might suggest. This works in a sliding motion, your abs / core take the strain as you slide up and down 4 different resistance levels. Feedback from buyers has been excellent, though you’ll find many people warning you to start on the ‘easy’ level until your abs are used to the action! There is a video on this amazon.co.uk product page, which shows this machine in action. You’ll get a simple A-frame machine. This has handlebars (like on a spinning bike) on the top – and padded ‘handles’ which hold your knees in place at the bottom. The construction means you can adjust the angle of the ‘A’. There are 4 settings, each will increase the difficulty of the action. This abs trainer comes in black only. You’ll need to assemble it (a 5-minute job according to the feedback). There are plastic plugs for the end to protect the floor – though as always it is worth investing in a rubber matt whatever type of home fitness equipment you use. It does fold away for storage – a big plus! There is also a small computer included, which tracks the number of reps.
You’ll find the action of this kind of device ‘deceptively simple’. While the action looks and feels easy, the effect on your abs and core is big. Seriously, start slow… build your core strength and then move onto the higher settings. Essentially you are using your abs to move your legs (which stay in a fixed position) up and down the slope. Down is just as important as up – you’ll get the biggest benefits from taking things slowly. You move the angle of the frame manually. There are 4 levels to go through. While it can be tempting to start at the biggest slope, get used to the action first. The Ultrasport Abdominal Trainer has a big effect on your abs even at the lower slope! 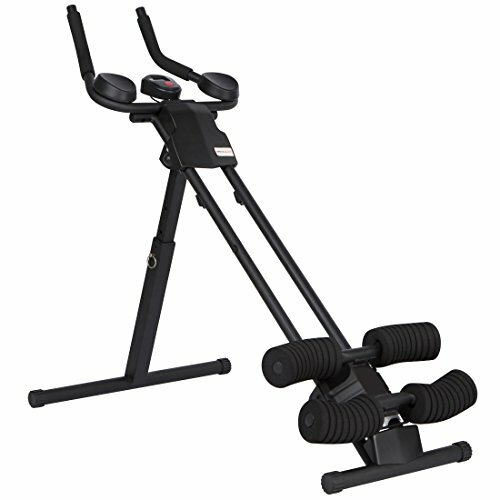 Feedback: What Previous Buyers Said About the Ultrasport 150 Adjustable Abs Trainer? Very positive feedback on this item (detailed in some cases!). One thing that kept coming up is that it is very simple – yet has a big effect on the abs / core. I’m always happy to see items where everyone agreed that it was easy to put together. This can be a big sticking point for some forms of home exercise equipment. Someone even came up with a handy tip for getting the plastic feet to fit snugly! Wrap Up: Is the Ultrasport Ultra 150 Abs Trainer Right for You? Going head-to-head with the WonderCore 2 and still coming out with a ton of positive feedback certainly shows there is something to this machine. Ultrasport say that 5 minutes a day will do the trick – and if the feedback from buyers is anything to go by this machine certainly has a little ‘kick’ to it. An abs roller wheel does a similar thing, at a cheaper price point. This does not have the adjustable setting, and for me is less likely to be used long term. I think the Ultrasport Ultra 150 is worth a look if you are dedicated to improving those abs. Just remember to start on the lower settings (especially if you have not worked your abs for a while!). Check out the video of this in action and read the feedback for yourself now on this dedicated amazon.co.uk product page.